What templates can I upload? A template is a source 'image' for a virtual machine. Essentially it consists of the root disk of a virtual machine, with a base operating system and applications software. A template can be an unmodified operating system from a software provider (Ubuntu Linux, for example), or it can be an image of a virtual machine that you have created and customised. This document describes how to upload and register a template. As well as uploading templates, you can create templates from VMs in your VDC, by using a snapshot of a root disk. See How to create a template from a volume snapshot. You may store a maximum of 20 uploaded or created templates in your VDC. You must ensure that your use of any template is compliant with the licensing requirements and the terms and conditions of the owners of any operating system or applications software that is contained in the template. Particular rules apply to the use of Microsoft products in a cloud environment; for more information see VDC Windows licensing. Please contact the Interoute licensing team, licensing@interoute.com, if you have any questions. 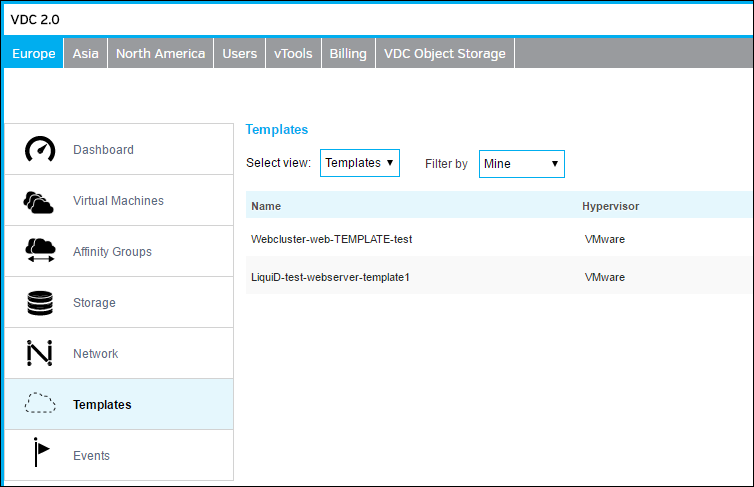 To see and manage the templates in your VDC, login to the Control Centre and click Templates on the left-hand menu. Make sure the Select view drop-down is set to Templates. Template formats are specific to each type of hypervisor. For the ESXi hypervisor in VDC, the required format is 'OVA'. An OVA template should preferably include a 'VMware tools' package. This enables VMs deployed from the template to be dynamically scalable (that is, the number of CPUs and RAM memory can be altered while the VM is running). VM images in OVA templates need to be single-disk to be uploaded to VDC (that is, only containing a root disk). However, it is possible to use a multi-disk OVA file by editing it into several image files. You can upload a template from any Internet static URL. A URL containing '?' or any active code (for example, 'php' or 'js') will not work. To begin uploading, click Templates in the left-hand menu and click the Add Template button. The first stage of the upload should complete within a few seconds (which means that the URL is resolved and an OVA file has been found): the new template name will be added to the list, and a 'Task success' pop-up box will appear in the bottom part of the screen. Since templates are large files they will typically take several minutes to upload. Click the name of the new template to display its status information. Check for the attribute 'Ready' being 'Yes' and 'Status' being 'Download Complete'. It is possible that the upload may fail if an OVA file cannot be found at the given URL, or if the OVA file is not readable; any errors will be indicated in the 'Status' attribute. Your uploaded template can be used in the same way as any of the standard templates to deploy a VM. At the template selection step of the Add Virtual Machine procedure (see How to create a virtual machine), click the My templates tab to see the list of your own uploaded or created templates. You need to test your new template with a full deployment, and login to the console, as failures due to incompatibility with the hypervisor virtual hardware are possible. Note that VMX-9 is the virtual hardware version that is currently supported by the ESXi hypervisor in VDC. An OVA file containing mutiple disk images cannot be used directly in VDC. However the OVA can be manually opened up and re-arranged into several image files, which can then be imported into VDC to rebuild the VM. Please contact VDC LiveChat for assistance.